Environment | Why Am I Me? Not much to say about this stunning film from Terje Sorgjerd, it’s just simply beautiful. I was holidaying in Cairns only a few weeks ago and have been following the news about Cyclone Yasi with some interest. Looks like it’s going to be a devastating storm, only weeks after other parts of Queensland suffered serious floods. It’s been brass monkeys the last week or two and there’s been some heavy snow falls across the UK as demonstrated by the satellite image above. What an amazing image. The world’s biggest offshore wind farm off the Kent coast is being officially opened later. Swedish energy giant Vattenfall said the 100 turbines are expected to generate enough electricity to power 240,000 homes. First time I’ve seen the ability to embed a video from the BBC website. London may soon follow in the footsteps of Bundanoon, the Australian town that last week banned bottled water and set up drinking fountains for thirsty locals. The capital’s first water stations will be set up this month in a move that could have serious repercussions for the £1.5bn-a-year bottled water industry, with companies finding it increasingly difficult to justify their carbon footprint as the quality of tap water improves. I was bemoaning the lack of drinking fountains yesterday and remembering an article I read about the ban on bottles water in Bundanoon and then saw this article on the very subject in the Observer a few hours later. I wonder how many photos were taken in Australia last week? Definitely a lot, that dust storm was some crazy weather. The worst dust storm in decades hit Australia on Wednesday, blanketing Sydney in red dust, and snarling up the transport system as earthquakes, giant hailstones and even a tornado swept the east of the country. Gale-force winds dumped thousands of tonnes of red desert dust on Australia’s biggest city, shrouding it in an eerie orange haze and coating the iconic Sydney Opera House in a fine layer of powder. 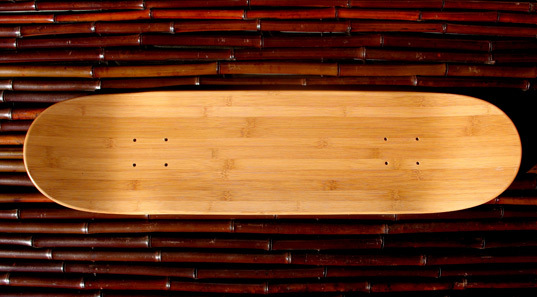 I bought some Bamboo flooring a few years ago and part of it’s appeal was it’s green credentials, so I was very interested in this article on bamboo skateboards I came across over at the Inhabitat website. According to the Science Channel “…skateboards have replaced furniture as the leading contributor to maple deforestation”. I remember that the shop I bought my flooring from telling me bamboo is stronger than oak but, as it’s a grass, crops in 4 to 6 years. I wonder how they are to skate though? That’s the real test, would be interesting to see if they are able to replace maple boards, that would have a massive impact on the US skate industry. Danny Way breaks his back, again! Ouch. Get well soon. The Do Lectures web site has been up for a few weeks now which has given me time to view a few of the videos, some quite interesting talks on there. The talks were organised by Howies, a clothing company based in Cardigan Bay in West Wales. The concept of the talks is pretty simple, invite people, 20 in all, to talk about what they ‘Do’. The lectures are aimed at spreading innovative ideas about design and living with a strong emphasis on environmentalism. I particularly liked the talks by Ken Yeang and Michael Braungart.